Renoir was a French painter and a leader in the development of the Impressionist style. Six of his paintings hung in the First Impressionist Exhibition in April, 1874, in Paris. Other than that, Renoir certainly needs no introduction from me. I note simply that he traveled in Italy between 1881 and 1883. In Naples he visited the National Museum and the ruins of Pompeii, later making mention of his admiration for the frescoes there. 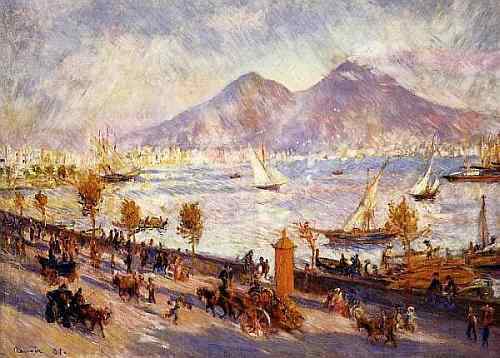 In 1881, he painted the work shown above: The Bay of Naples (Morning), a work that shows why the phrase “sparkling color” crops up in so many descriptions of Renoir's works. Here, even the centerpiece of Vesuvius is reduced to a secondary role by the “impression” of sparkle, even glare. (Your eyes should start to hurt if you look at this too long, exactly as they would if you stood at the spot in person and stared out at the bay.) When I first looked at it, I thought it had been painted from the area along the sea approximately where the Villa Comunale ends and before you get to Mergellina. I wondered why the Castel dell’Ovo was missing —maybe artistic license since castles are notorious for not being “sparkley,” no matter how hard they try. Then it occurred to me that the coast road I was thinking of, via Caracciolo, didn't exist until 1900. The view was probably painted from farther east, the old Santa Lucia road. (That road still exists but no longer has the unobstructed view of the bay it had in 1880.) That would also let Renoir off the hook for leaving the Castel dell'Ovo out of the picture; it would have been behind him.